Make this all-American mall classic in the comfort of your own home. 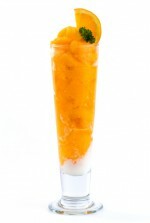 This Orange Julius recipe made from healthier ingredients is sure to hit the spot. Add the ice and blend until frosty.